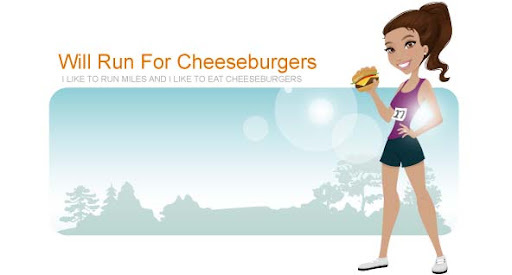 Will Run for Cheeseburgers: happy birthday to me! Not only is it my birthday (yay!) but it's also St. Patrick's day. Gotta love sharing my birthday with a national drinking holiday. Hope everyone is ready to drink some green beer on a wednesday night. The pros of having all of my girlfriends in town to celebrate 3 days of bachelorette/bridal shower excitement are nonstop laughter, crazy shenanigans, and major bonding through way too much girl talk. The only con I can think of is not having worked out since Wednesday night. Yikes! Don't worry though ... I managed to eat some cheeseburger sliders from Hamburger Mary's on Saturday night. At least I didn't slack on my cheeseburger eating and only on running! I finally made it into the gym yesterday after work. I decided to ease back into working out by running on the treadmill. I did 3 miles in 27:30 minutes, using some minor incline again. I wasn't running as fast as I probably should have been but at least I got 3 miles done. I had to rush once I got upstairs since Ryan was taking me out to dinner for my birthday! After a quick shower and some minimal getting ready time we were ready to head out to Chez Vincent in Winter Park. Poor Ryan wasn't feeling all that great though. He had pulled a back muscle getting onto the train in Boston on Monday (old man Chalmers) and had gotten some pain pills from the doctor yesterday. They were definitely making him loopy so I figured it was only a matter of time before he fell face first into his plate of filet and mashed potatoes. Lucky for us he made it through the entire delicious meal.